We’re beginning our South American adventures in beautiful Bogota, Colombia. I suspect just the words “Bogota” and “Colombia” set off alarm bells in the minds of many of you. (ahem…grandparents?!) People hear “Colombia” and immediately think, “Is it safe?” It’s not unreasonable. I know I did. The fact is safety is an concern here, perhaps more so than other places we’ve visited. Before deciding to come here we did a good amount of research, thought long and hard about the issue of safety, and evaluated what we could do to minimize risks. In this post, I’d like to explore this issue. Like much of Latin America, Colombia has a violent history and a reputation as a dangerous place. 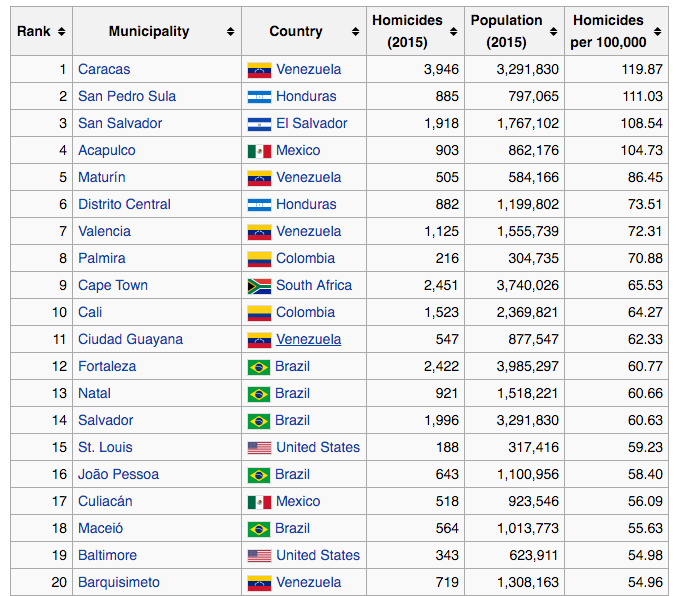 In years past, the cities of Bogota, Medellin and Cali have been ranked among the world’s most dangerous. Communist FARC guerrillas have wreaked havoc from the jungles of the countryside, and violent drug cartels have often proven to be more powerful than the (often corrupt) local police and military. Not exactly confidence inspiring, or the recipe for a tourist attraction. Colombia’s newly resurgent capital boasts beautiful colonial buildings, chef-driven restaurants and cool new cafes and galleries. Bogotá is popping up more and more on travelers’ radar these days, thanks to its increased safety, an explosion of culinary creativity and a rapidly increasing cool quotient. Visiting Bogotá now means leaving behind outdated ideas — like drug wars and gangsters — about Colombia. Today, this city exudes vitality and verve. You’ll stumble upon streets filled with hip new shops and chef-driven restaurants. And the city’s abundant colonial architecture, along with its eye-catching murals and colorful graffiti, form a backdrop that lets visitors forget about the traffic and other petty inconveniences. Down some Colombian coffee and tackle the city with the energy it deserves. This is true. Bogota is a fantastic city but safety and security are still a concern. Many people say that Bogota or Medellin are “as safe as any big city in the US” or “safer than Detroit.” I’m not so sure that’s true, especially for tourists, but I don’t think that today’s Colombia is as dangerous for tourists as it used to be, or as some might think it is. Let’s explore this issue of safety. What’s the real risk? Measuring risk from violent crime is not simple. Statistics are unreliable and many crimes go unreported. 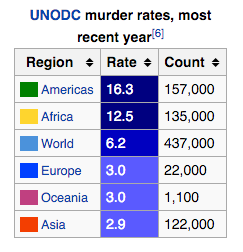 That said, the “homicide rate” is often used as measure to asses the level of violence and risk in a given country. 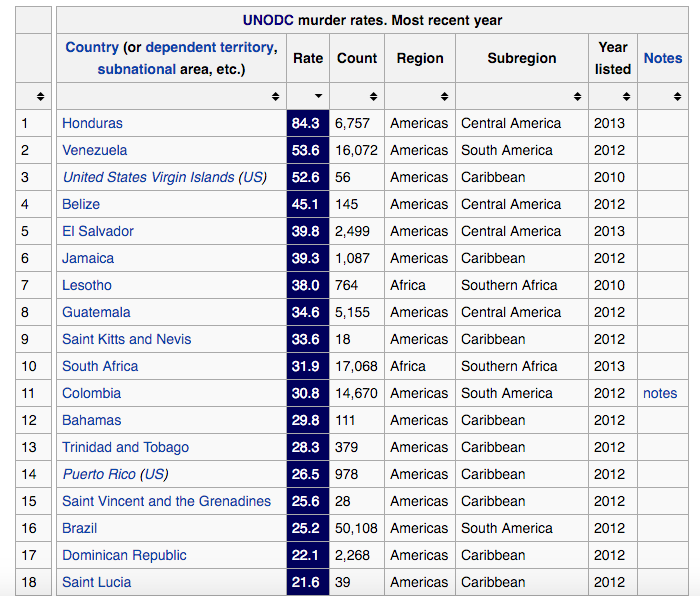 Wikipedia has an article which ranks countries by homicide rate, based on a United Nations study. As you can see, Colombia is #11 on the list, well below the popular tourist destination of the US Virgin Islands and Jamaica, and just above the Bahamas. OK, at least Colombia is not at the top of the lists. That’s good. We can also see that some US cities and popular tourist destinations are fairly high on the list. That’s might surprise some people. The question is how do these statistics translate to actual risk for visitors? It’s hard to know, isn’t it? It could be that the high murder rate in one place is a function of gang-on-gang violence that leaves most residents and visitors untouched and at low risk. It could also be that street crime is out of control and virtually everyone is at risk, perhaps tourists in particular. There are lots of possibilities and without more information it is simply impossible to really know. Remember too that these are statistics on homicide and may not correlate with other types of crime or risks to tourists. If we move beyond these statistics and look for anecdotal evidence, we’ll find a good amount of evidence that suggests that tourists and visitors to Colombia (and much of Latin America) are at risk of being victims of crime. Levels of street crime appear to be very high and tourists are often targeted. On the web there are noteworthy number of people describing muggings and robberies and other crimes. For example, look at the results of a Google search for robbed in Bogota or mugged in Medellin. Before we decided to come to South America, I did quite a bit of research looking for information on the most common types of scams and crimes targeting tourists and the circumstances surrounding them. As you might imagine, as in other places around the world, pickpockets very are common across Latin America. In South America, a common variation of the pickpocket game is the “mayonnaise/ketchup/bird poop/human feces” trick in which the perpetrators squirt something gross on you as a distraction. Often a “friendly” lady will appear to let you know you have something gross on your back, and produce a handkerchief or tissue to help wipe it off. Meanwhile, her accomplice will pick your pocket or walk away with the bag you just set down. (This is common in parts of Europe too.) There is a more violent version where a bucket of diarrhea or other highly disgusting goo is dumped on you from a rooftop or window above. When you stop in shock and horror, dripping with goo, you’re rushed by thugs and violently robbed. Here is one man’s account of this in Ecuador. Pickpocketing is common in Europe, Asia, everywhere really. Most of the time it is a crime of stealth – not a violent crime. We’re experienced and alert and have never fallen victim to pickpockets. While we certainly don’t want to lose money or valuables, we are much more concerned about violent crime. It would seem to be true that violent crime targeting tourists is more common here than in many other parts of the world, certainly more than the areas of Europe and Asia where we’ve been over the past 9 months. Our first day in Bogota we met a tourist who’s friend was robbed the night before. She was attacked by a man with a screwdriver at the front door of her hostel. The door was locked and the staff of didn’t unlock it and let her in until after the thief had robbed her and left. Nice, huh? We’ve read and heard about at least a dozen similar attacks in Bogota. Many (but not all) of them appear to have happened at night, in a particular neighborhood (La Candelaria) that is popular with backpackers and other tourists. Back in 2011 there was a series of attacks on hostels in this area, where armed robbers “seized” the building and went room-by-room robbing and assaulting the guests staying there. In one instance an American tourist resisted and was shot and killed. I bet you can guess that we are not staying there, or walking around La Candelaria at night! Like many big cities, there are a number of areas in Bogota where walking is not advisable, but taxis in Bogota can present their own dangers. In this 2013 is article, The City Paper Bogota describes what is know as a “paseo milionario” a type of robbery common enough to have earned a nickname. Last year, an American tourist was killed in a taxi robbery in Medellin, and there are numerous other stories online of tourists being robbed in taxis. Safety tips for Colombia visitors inevitably cover the subject of avoiding taxi-related crimes. (We’re mostly using Uber). Crime. Pickpocketing, muggings, murder. These words paint scary pictures in our minds. I could go on, but perhaps detailing all the common types of crime might simply serve to overemphasize the actual level of risk. The bottom line is that there is a risk associated with almost everything we do. When we understand those risks, there are almost always things we can do to mitigate or lessen them. We recognize that crime is more of a risk in Colombia and Latin America than in many other places. We’ve done our homework to assess that risk as accurately as we can and we have taken steps to mitigate that risk. We’ve changed the way we travel on this part of our trip to help ensure that all goes smoothly and safely. For many people, violent crime is the bugaboo in Latin America. There is no doubt that it is a real concern. But let’s remember that crime is not the only risk. Life is full of risks, and sometimes we ignore them or fail to assess them accurately. Let’s go back to some statistics for a little perspective. If you recall, the homicide rate for Colombia was 30.8 per 100,000 population . As a point of comparison, the rate of traffic fatalities in Thailand is higher than that: 36.2 per 100,000 population. The rate of traffic fatalities in Colombia is 16.8 per 100,000 population. 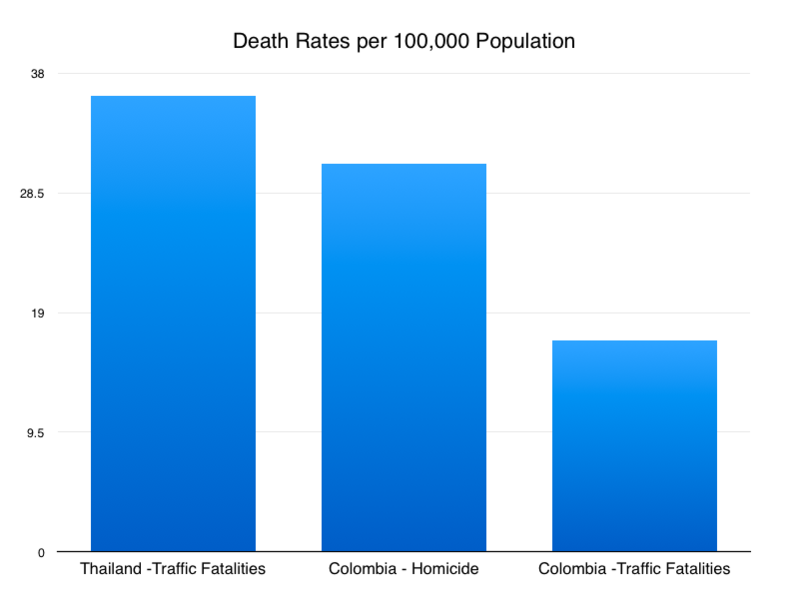 One could argue that the much feared crime in Colombia is less of a risk than the traffic in Thailand! It is a simplistic view, but I think you get my point. Thailand has one of the highest traffic fatality rates in the world, and yet in 2015, almost 30 MILLION (!) people visited Thailand and took to the roads. How many of them considered the risks? We tried to mitigate the risks by being very mindful of our transportation choices. Forewarned is forearmed. One might say that life is a series of calculated risks (and rewards). The fact remains that crime is a concern here. While some people do have their visits spoiled by crime, many more do not. We aim to be among the latter. We are being very careful, and expect to have a fun and safe visit to Colombia and other destinations in South America. I promise the next post will be a more cheery one. After all, we’ve been having a great time in Bogota. The weather is perfect, the setting beautiful, the people friendly, and the food delicious!